Whatever is happening karae s aapaae - it is God doing everything. Every action is happening through God's Will. 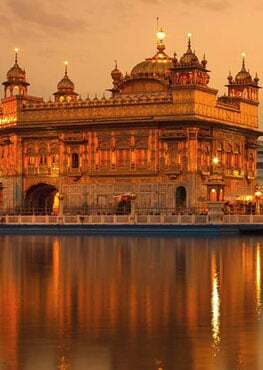 har aapae kaar kamaavai - Waheguru is the one who is carrying out all deeds, all kaar. Waheguru Himself is the One who has created this whole bisthaaraa - this whole universe, everything we see, through the panj tath - through the five elements. What are the five elements according to Gurmat? So Guru ke piareeo Maharaj has created these five elements. Vich dhaathoo panch aap paavai - with these five elements there are five senses which are attached to these elements. Now which senses are attached to which elements? It is through each of these elements that we experience each of these senses. Without light we see with our eyes, so the fire element is working through that sense. With the water in our mouth we taste all different tastes. Through the ground we can smell all the different things that we can smell, we feel the breeze of the wind with touch. Through space we can send out sound -shabad. I have no enemies left, I have no conflicts left. Wahegurujee has taken away all of my conflicts.